The term Inbound Marketing and it’s methodology are both fundamentally flawed and harmful to marketing practitioners trying to find the best ways to grow and help their businesses succeed. Did you know that even Hubspot uses methods like paid promotion and advertising as part of their standard content promotion process? I know this because it was part of the presentation by Hubspot’s own Amanda Sibley at Inbound 2014. When that part of the presentation was shared, Amanda added jokingly that “we keep that hush hush because it’s not really ‘inbound’.” Although I already had a number of issues and concerns about Inbound Marketing before that presentation, Amanda’s quote inspired me to dive deeper into those thoughts. While researching I came across a slew of definitions for the same exact term, Inbound Marketing (confusing, I know). In fact, many of them came from the same source (Hubspot, the inventors of the term). I believe this is a good place to start outlining my argument against the mass adoption of the term and philosophy. I’ll touch on this more later, but the concept of pulling potential customers in by creating and sharing helpful and relevant content is nothing new. In fact, companies have been doing this for over 100 years. This sounds like a piece of the definition of Content Marketing. The only difference between this definition and the definition of Content Marketing, is that Content Marketing’s definition includes the added objective of creating this type of helpful content in order to drive profitable customer action. Additionally, Content Marketing is something that can be applied to multiple business objectives from new customer acquisition, to customer retention, customer satisfaction and more. Is this really what defines Inbound Marketing? Excuse me as I ramble here but it’s unfortunately the only way I could attempt to derive reasoning from an unreasonable concept and definition. My problem with this definition is that it lumps content, SEO and social media together as tools used to attract customers as if they are all on the same plane. In reality, the content is the backbone of this definition and SEO and social media are channels used to promote that content and provide your valuable help. Again, this feels like a customer-acquisition based content marketing strategy using mainly SEO and social media as promotional channels. Throw a paid Facebook ad campaign in there and all of the sudden you aren’t doing “Inbound Marketing?” Does this mean the definition of Inbound Marketing is really something like: “Inbound Marketing is Content Marketing that doesn’t allow for any “interruption” type promotion or advertising. Any such promotion disqualifies your strategy as Inbound?” If so, I believe this proves my point that the distinction of “inbound” and “outbound” strategies is harmful to practitioners. This definition describes Inbound Marketing as an exclusionary strategy that paints often viable options for marketing and advertising as negative alternatives rather than complementary parts of a sound marketing plan. Here is a detailed distinction of what strategies might be considered “inbound” and “interruptive”; http://marketingland.com/the-changing-definition-of-inbound-marketing-why-seos-and-sems-should-care-46187. 3) Inbound marketing refers to marketing activities that bring visitors in, rather than marketers having to go out to get prospects’ attention. Inbound marketing earns the attention of customers, makes the company easy to be found, and draws customers to the website by producing interesting content. See my argument above for #2. To me, this is a soft attempt to define Inbound Marketing and to allow for flexibility for an extremely confusing and difficult-to-define terminology. Is a hyper targeted advertisement to someone who is interested in your product/service marketing with a sledgehammer? What if I share my content with someone who finds it useless and annoying through social media? Where is the arbitrary line drawn and who is deciding? Better yet, why? Why not let common sense prevail instead? 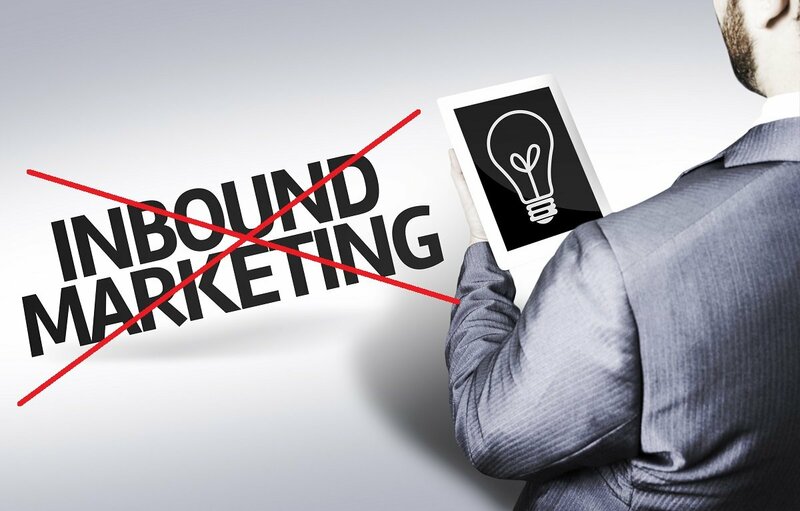 Is this what Inbound Marketing really means: Inbound Marketing is about using content to attract a user to give you their contact information so that you can then attempt to sell to them.? As I mentioned earlier, the concept of being helpful and “pulling people in by sharing relevant information [and] useful content” has been around for over 100 years. Brands like Jello, John Deere and more have been creating and distributing valuable content to earn and retain customers far before Brian and Dharmesh had their groundbreaking epiphany. Hubspot lists the words “blog” and “keywords” as ⅔ keys to their attraction phase related to the Inbound Marketing model. One highly touted example of Inbound Marketing success is that of Marcus Sheridan and his business River Pools and Spas which grew tremendously as the result of Marcus’ blog postings. The River Pools and Spas founder began answering questions potential customers may have about his product offering (in this case, fiberglass pools) via a series of blogs. Potential customers found Sheridan’s blog via search engines when they performed searches around topics he had written about there. This is called the long-tail strategy of SEO. Because River Pools and Spas didn’t have a number of competitors creating this informational content, he was able to dominate the search rankings around the topics he was writing about. Unfortunately, 5 years later, this is not a viable strategy for 99% of businesses. Don’t believe me? Try performing a Google search for a question a potential customer might have about your product or service and scroll through the pages of search results displaying dozens, if not hundreds, of blog posts and web pages discussing the topic. If you’re in a niche where your competitors aren’t creating this informational-type content about your product or service consider yourself one of the lucky few and move ahead with starting a blog in this manner. With an extreme saturation on the web of informational blog postings answering potential customer’s questions, it’s my contention that you’ll have a very hard time getting your blog posts to perform and rank well without heavy SEO (authority/link building) investments over months and years. Regardless, creating and leveraging a blog in this manner has and continues to be a hub for businesses attempting to implement the Inbound Marketing methodology. Hubspot has always perpetuated that the key to attracting potential customers is to answer their questions in the form of a blog. As previously mentioned, this is a strategy that simply won’t work for most businesses in 2015. Why? Because (in addition to the points outlined in the previous section), this model fails to answer key questions required of building a sound Content Marketing strategy. Real Content Marketing fills a need. Can you fill a need if someone has already created the content you’re planning to create? Real Content Marketing focuses on building an audience by researching and identifying a specific content niche where you can be best of breed. The one-size-fits-all blog approach to Content Marketing as outlined by Hubspot fundamentally fails to answer key questions required to succeed. I’d even go as far as to say that I believe those who have succeeded with Inbound Marketing have actually done so because they’ve answered these key questions (whether by luck or intention) and succeeded in building an audience. Further evidence of Hubspot’s (and its plethora of loyal Inbound Marketing believers) misunderstanding of content marketing can be seen here. Content Marketing is not a subset of Inbound Marketing. Content Marketing can be both Inbound and Outbound in nature. It can be found or promoted either way. Additionally, Content Marketing isn’t only a top of the funnel mechanism, it can be applied to areas such as customer loyalty and retention, customer upselling and more. Dating back to 2011 I’ve seen first hand the appeal of the Inbound Marketing methodology and terminology to marketing agencies and professionals. By using a single term to define a set of tactics (from SEO and Content Marketing to social media, lead nurturing and more), Hubspot gave practitioners a way to sell a package of services together leading to increased retainers. Hubspot has earned mass scale adoption from agencies, I believe, for this reason. Additionally (and perhaps more importantly) it gave agencies a reason to funnel client budgets away from advertisers and into service retainers. I believe it’s completely ludicrous to implement a marketing strategy that doesn’t include some direct promotion (through advertising) of your product or service and its unique value messaging if you can do so effectively. A sound marketing strategy combines all available options to produce results both short term and long term and it’s open to looking at all available channels. I believe that a better approach for companies seeing lackluster results from the Inbound methodology is to completely change the way you think about Content Marketing. Reframe your strategy by creating a mission statement, find a niche where you can “win”, and gear your Content Marketing efforts toward attracting an audience that you can leverage to achieve key business objectives and attract new business. These are key components of a sound Content Marketing strategy. When it comes to promoting your content and building an audience, you should always consider all available promotional channels. Use the latest technologies, trends and channels to ensure people find you when they are in the market for your product or service. Optimize your website, build a positive online reputation and make sure that your business has a presence when potential customer are looking. This is done primarily through SEO, SEM , & Barnacle SEO. If directly selling to potential customers is an options (which it is for most B2B companies), you should definitely have a sales strategy as well! It’s not my intention to be negative and critical for the sake of complaining. It’s my goal and objective to further a discussion that will allow for marketing practitioners to perform their jobs better, to produce better results for the businesses they represent, and to be open to any and all strategies and channels that will allow them to do so. The exclusionary nature of Inbound Marketing isn’t helpful, it’s harmful. I’d love to hear your thoughts and opinions and look forward to discussing via the comments below!